Annual or short-lived perennial herbs, rarely shrubby, often ± divaricately branched, unarmed, glabrous or pubescent with simple eglandular or glandular hairs Annual or short-lived perennial herbs, rarely shrubby, often ± divaricately branched, unarmed, glabrous or pubescent with simple eglandular or glandular hairs. Leaves alternate, often 2 or 3 appearing together, mainly towards the ends of branches, abruptly or gradually tapering into a slightly winged petiole, mostly entire, to weakly dentate; minor leaves sometimes present Leaves alternate, often 2 or 3 appearing together, mainly towards the ends of branches, abruptly or gradually tapering into a slightly winged petiole, mostly entire, to weakly dentate; minor leaves sometimes present. Flowers 1–few, extra-axillary, leaf-opposed or appearing axillary, actinomorphic Flowers 1–few, extra-axillary, leaf-opposed or appearing axillary, actinomorphic. Calyx short, broadly campanulate to shortly tubular, 5(7)-ribbed, truncate, entire or 5(7)- or 10-dentate; teeth short, setaceous, often splitting at the sutures; in fruit usually slightly enlarged Calyx short, broadly campanulate to shortly tubular, 5(7)-ribbed, truncate, entire or 5(7)- or 10-dentate; teeth short, setaceous, often splitting at the sutures; in fruit usually slightly enlarged. Corolla purple to bluish, yellowish, white or greenish, sometimes spotted, rotate to widely campanulate; tube short; limb plicate, deeply 5(7)-lobed, the lobes never overlapping in bud, with induplicate-valvate or valvate aestivation Corolla purple to bluish, yellowish, white or greenish, sometimes spotted, rotate to widely campanulate; tube short; limb plicate, deeply 5(7)-lobed, the lobes never overlapping in bud, with induplicate-valvate or valvate aestivation. Stamens 5(7), variously inserted in the corolla tube, ± exserted; anthers oblong or cordate, connivent or free, basifixed, the ± parallel thecae dehiscing by longitudinal slits Stamens 5(7), variously inserted in the corolla tube, ± exserted; anthers oblong or cordate, connivent or free, basifixed, the ± parallel thecae dehiscing by longitudinal slits. Disk inconspicuous or none Disk inconspicuous or none. Ovary 2(4)-locular; ovules hemicampylotropous, numerous in each locule, on a placenta adnate to the dissepiment or arising from the central angle of 2 dissepiments at the base. Ovary 2(4)-locular; ovules hemicampylotropous, numerous in each locule, on a placenta adnate to the dissepiment or arising from the central angle of 2 dissepiments at the base; style filiform; stigma capitate or slightly dilated, obsoletely 3-lobed or difformed. 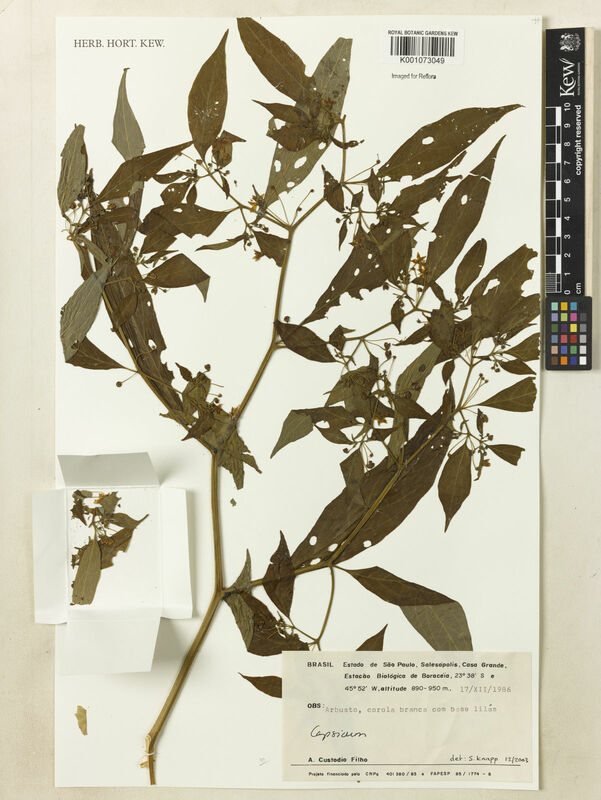 The literature and nomenclature surrounding these species, their varieties and cultivars is vast, complex and controversial with some authors still disagreeing over the treatment of various taxa, and even their common names. The history of their spread from the centres of origin to the rest of the world, and their early taxonomic treatments are given in Irish (1898), while Heiser & Smith (in Econ. Bot. 7: 214–227 (1953)), Heiser & Pickersgill (in Taxon 18: 277–283 (1969) & in Baileya 19: 151–156 (1975)) and D’Arcy & Eshbaugh (in Baileya 19: 93–105 (1974)) for example, all deal with successive treatments of the cultivated peppers and their complicated synonymy. The latest resumé of the generic taxonomy is given in Bosland & Zewdie (2001). 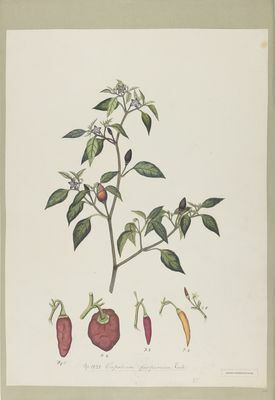 These species display considerable variability in the shape and colour of their fruits, with the characteristic pungency being due to capsaicinoids, a mixture of seven phenolic amides or vanillilamides, which are unique to peppers (cf. Hunziker, 2001), and are concentrated in the seeds and inner surfaces of the fruits. Bosland & Zwedie (2001) found that capsaicinoid profiles were not consistent within species and therefore of limited use as chemotaxonomic identifiers. In addition to their pungent culinary value, these substances are also used medicinally - usually internally as a carminative and stimulant, and for flatulence and appetite loss, though they can cause skin irritation and blistering. A summary of the wide range of medicinal uses of these plants is given by Heiser (in Nightshades: 6–27 (1969)). 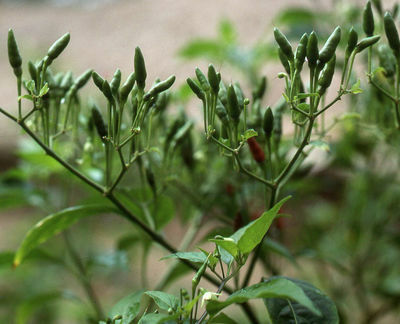 Birds are thought to be immune from the pungent capsaicin in the fruit pods which prevents animals from eating them, but enhances dispersal by fruit-eating birds. The generic name, adapted from the Greek kapto, meaning to bite, refers to the hot taste of the fruits. The cultivated species are also widely consumed as a vegetable with the fruits providing a rich source of vitamins A and C, and occasionally grown as ornamentals. 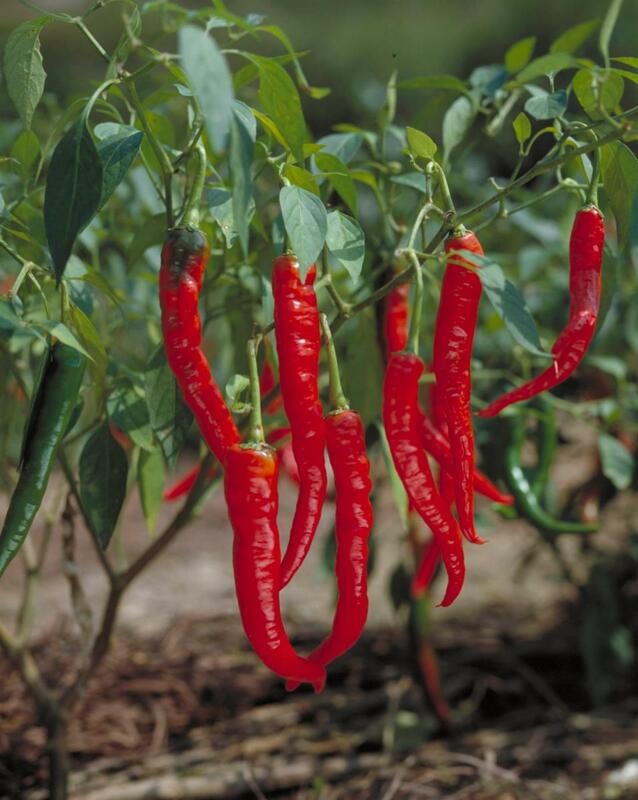 Though peppers rarely constitute an important commercial crop anywhere in Africa (Eshbaugh, 1983), in the US the sweet pepper crop in particular is very important commercially, with many varieties being grown ( cf. Heiser, 1969). 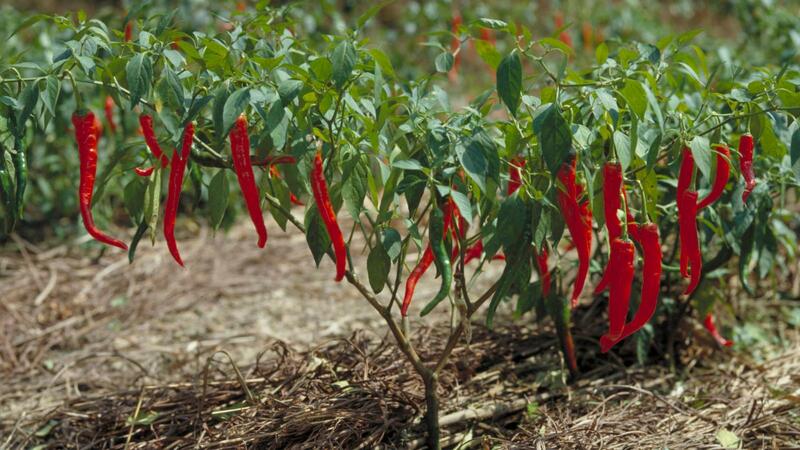 Capsicum is an economically important genus whose species are major spice and vegetable crops throughout the world. 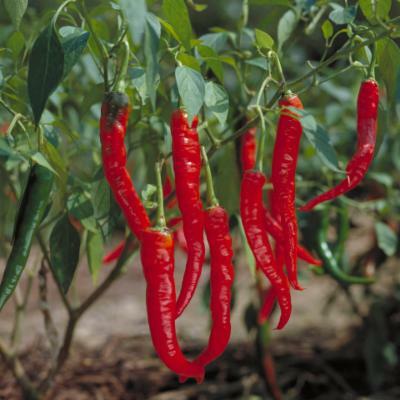 They are universally known as peppers or as cayenne, chilli, sweet, green and red peppers and are probably the most important and widely consumed condiment. The introduction of Capsicum to Africa probably occurred through a combination of postColombian explorers, missionary work, colonial invasion, and trade ( cf. Eshbaugh, 1983); by the mid-1800’s there were reports of these species in various African countries. 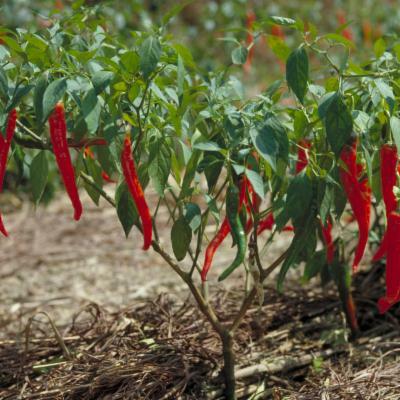 “Morogoro Chillies” otherwise known as ‘Habaneros’ or ‘Scotch Bonnets’, are apparently popular in East African cuisine, but these plants seem to be confined to cultivation. 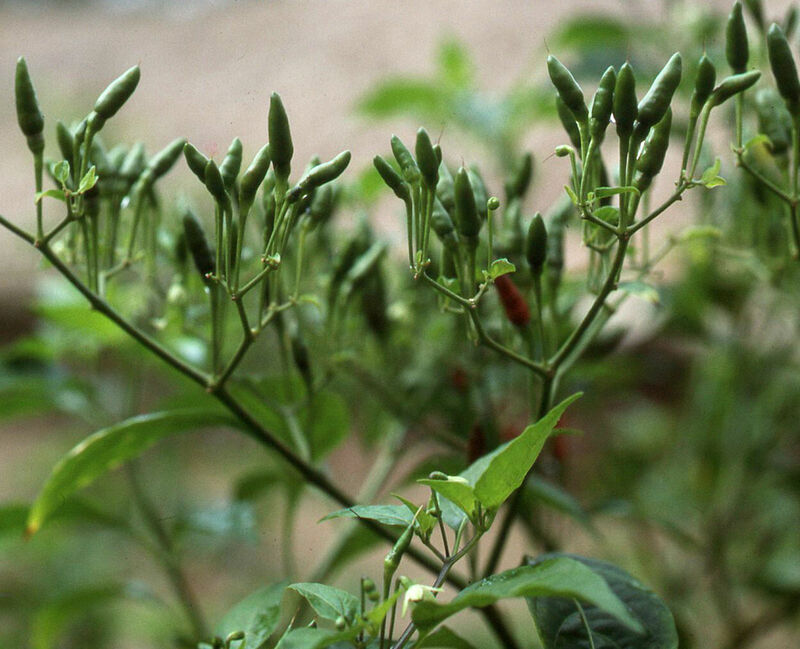 They are cultivars of C. chinense Jacq. and though they may occur as escapes in some regions, this species has not been encountered during this revision. 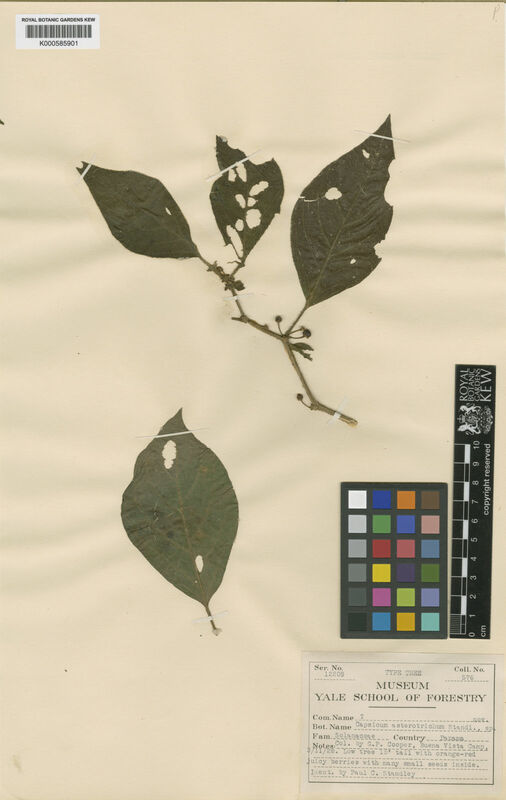 Though some East African specimens have been identified as C. baccatum L., this species has not been positively identified from this region (see Excluded species, at the end of this genus). Hunziker (2001) considered that the genus comprised a natural assemblage of around 20 species and a few varieties, growing from Mexico to Central Argentina. Five of the species were domesticated, of which two, C. annuum and C. frutescens, are widely cultivated throughout Africa, while a third, C. baccatum has remained largely confined to South America, occasionally occurring as an introduction in Africa. Smith & Heiser in Am. J. Bot. 38: 362 (1951). Hunziker, Gen. Solanacearum: 232 (2001). Gen. Pl., ed. 5: 86 (1754).